South Afton Industrial Park in Williamsburg Township. BATAVIA, Ohio – The Clermont County CIC has sold its first property at South Afton Industrial Park to Duke Realty, which will build a $17 million, 617,760-square-foot, build-to-suit distribution facility for Design Within Reach, a furniture and home accessories company. Design Within Reach expects to employ 85 people at its facility. A groundbreaking is scheduled for Aug. 15 and Duke Realty expects to finish the project by early 2019. Duke Realty closed on its purchase of 46.83 acres at South Afton for $30,000 per acre on July 9. South Afton, which is located on State Route 32 at Half Acre Road in Williamsburg Township, is a 242-acre industrial park in Clermont County. 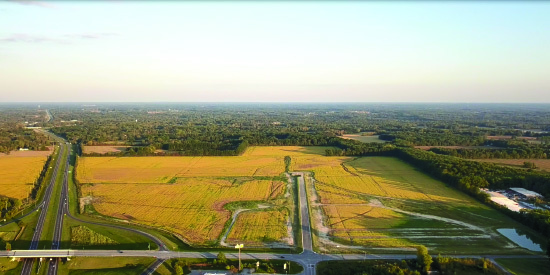 The Clermont County CIC purchased the land in 2016 to develop a business-ready site that would be attractive for both manufacturing and distribution businesses. “We’re thrilled that our new facility will contribute to economic growth in the local area with the creation of many new jobs,” said John McPhee, President of Design Within Reach. “This new facility will incorporate modern features that are designed to enhance storage, distribution and fulfillment capabilities and provide excellent access to several major highways,” said Dan Colletto, Vice President of Leasing and Development for Duke Realty in Cincinnati. Under an Ohio Enterprise Zone agreement approved by the Board of Commissioners on July 25, the project was granted a 20% tax exemption for 10 years on real estate taxes, saving approximately $75,000 annually. The Williamsburg Township Board of Trustees approved the agreement on July 9. On July 30, the Ohio Tax Credit Authority approved job creation tax credits for Design Within Reach. Gary Jordan, Chairman of the Williamsburg Township Board of Trustees, said, “We’re excited to have Duke Realty and Design Within Reach as the first project at South Afton. We thank them for investing in Williamsburg Township and wish them the greatest success! About Design Within Reach: Design Within Reach, Inc., founded in 1998 and headquartered in Stamford, Connecticut, sells its furniture and accessories to residential and commercial customers. It is a subsidiary of Herman Miller, Inc. More information can be found here: http://www.dwr.com. About Duke Realty: In the Cincinnati metro area, Duke Realty owns, manages, or has under development nearly 10 million square feet of industrial properties. Nationally, Duke Realty Corp. owns and operates 150 million rentable square feet of industrial assets in 20 key U.S. logistics markets. Duke Realty is publicly traded on the NYSE under the symbol DRE and is listed on the S&P 500. More information about Duke Realty Corporation is available at www.dukerealty.com.